After spending their summer in Paynesville, Jeff, Diane, Maggie, and Joe McCarron recently returned to Warsaw, Poland, for a third school year. 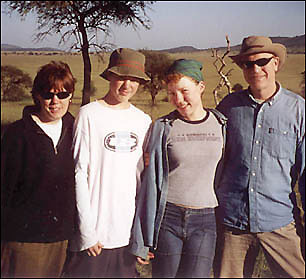 Although her sisters had been teaching overseas for many years, Diane McCarron never expected that her own family would take part in such an adventure. "We played around with the idea," admitted Diane, "but we never really expected to go anywhere." The McCarron family - Diane, Joe, Maggie, and Jeff - recently departed for a third year of living, learning, and teaching in Poland, after spending the summer in Paynesville. "It all began in the spring of 2000," said Jeff. Late at night, he received an e-mail from Diane's sister, explaining that there was a last-minute teaching opening in Poland at the American School of Warsaw. Jeff remembers sharing the news with his wife. "I said to Diane, 'Do you want me to tell you something that will keep you up the rest of the night, or do you want me to wait until the morning?' and she said, 'Tell me now!' "
Diane's immediate concern that sleepless night was the difference in the amount of daylight between Minnesota and Poland. She stayed up until 4 a.m., researching the differences in climate on the Internet. She was worried that Poland would be dark nearly all the time during the winter due to its latitude, but the difference was not as drastic as she had thought. After living in Paynesville and holding the same jobs for 13 years, the McCarrons decided it was time for something different. "We wanted to go," said Joe, 15. His older sister, Maggie, 16, was also looking forward to the move. In early June, following an interview and application process, the McCarrons were notified of their acceptance. At the American School of Warsaw, Diane teaches special education, and Jeff has taught physical education and done some publications work. Although the school teaches an American curriculum, the students come from all over the world. The school was started in the 1950s in an apartment room by the wives of the embassy staff for their kids, said Jeff. Since then the school has grown to include 800 students of 56 nationalities in grades K-12 - making it the largest international school in the world. Just two years ago, classes were still being held in the separate buildings of first-year residence halls for priests. Most classrooms were the size of dorm rooms. 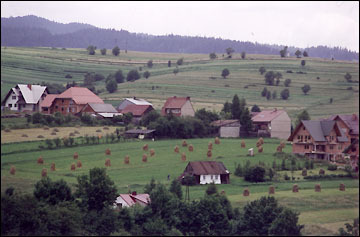 The typical countryside in southern Poland features long, narrow fields behind rows of houses. Farm fields tend to be about five acres in size, with many farmers still using horses and horse-drawn equipment. Last year, the school finally moved into a brand new facility. As a private school, the cost of attendance is around $16,000 per year. Jeff estimated that about 20 percent of the students are American, 20 percent are Polish, and the other 60 percent are from diverse cultural backgrounds. Many of the students live at the American Embassy or are the children of parents who are diplomats or whose work requires them to live overseas, said Jeff. Many of the students already speak English, but even those who don't are put directly into mainstream classes while also taking additional courses in English. "It's sink or swim, and there's very few sinkers," said Diane. In addition to Diane's sister and brother-in-law, Linda and Robb Hoiseth, the McCarrons were surprised to find that several other Minnesotans work at the American School of Warsaw, but then reasoned, somewhat jokingly, that the Polish climate is relatively milder only for Minnesotans. Academics are of high importance at the school. Sports do not dominate as they can in the United States, said Jeff. "Clubs like Knowledge Bowl are given just as much respect as sports," he added. Middle school sports have practice two days a week, and varsity sports have practice three days a week. The teams travel for events on Saturdays. Because they are larger than area schools, they have trouble finding equal competition - either they play smaller schools, or they play specialized Polish clubs that are very good. At the end of the season the teams get to fly to the capital for an eight-team tournament as a season finale, where they're finally able to play equal competition, said Jeff. The school also has a rather flexible curriculum. Teachers as well as students are encouraged to think of things to add to the curriculum. "It's the kind of school where if you come up with an idea of value, you can do it," said Jeff. Joe's favorite class was exploratory. He and a couple of friends wanted to learn about filmmaking, and they were able to make a couple of films as a class. The class studied a wide range of topics of interest to the students, including architecture, quilting, journalism, and drama. Jeff has some funny stories about teaching American sports in a foreign country. He laughs when he remembers his students, who are all soccer fanatics, playing basketball. "In basketball, they score about as often as soccer, so it's a big deal," he explained. After each basket, the students stop playing to jump up and down and slap high fives. Diane's favorite part about teaching overseas is how easy it is to travel as a family. "You can get on a train and go to Krakow or Prague or Berlin - almost anywhere," she said. In addition to going to interesting places, the McCarrons have met some interesting people. Besides the other Minnesotans, the people who work at their school come from many different backgrounds. One of Maggie's friends from school is the daughter of the United States ambassador. "She's got some interesting stories," said Maggie. Jeff explains how, at home, it is common to have several groups of friends for different activities. In Poland, however, the McCarrons don't know nearly as many people, so they have formed some very close friendships with their co-workers. "There are no other family, religious, social, or working groups - they become that all in one," said Jeff. When traveling, sometimes four or five families from the school will all go on a trip together, said Diane. Between traveling to new places and meeting diverse company, the McCarrons are always learning something new. "You get a totally different perspective on the world," said Maggie. Diane thinks of the experience as a "giant field trip" for their kids. When they first arrived in Poland, there were several everyday things that the McCarrons noticed were different. "I couldn't golf!" said Jeff. "No dryer!" said Diane. "You can't say, 'I can't believe she's wearing that!' because they'll probably understand you," cautioned Maggie, who quickly found that the Poles know more English than they'll lead you to believe. Maggie was surprised that "you don't see shorts or jeans on women," and she added that Polish rap is "kinda scary." Maggie also found that drivers are a lot more calm in Poland and that the cars are "small little square boxes." She recalls a time when she was out with friends and someone parked them in. "They just shrugged their shoulders and picked up the car and moved it," she said. The street and local people in Zakopane, Poland. Joe was surprised at how little time people spend mowing grass. "They only mow their lawns like four times a year," he said. Jeff was taken aback that the Polish let the grass go to seed in boulevards. At first it seemed like it was unkept, but eventually he adjusted and realized that's just how they do things. Poland's landscape looks a lot like Minnesota, said Diane. "You can recognize the same trees," she said. Many of the natives in Warsaw live in old block buildings from the Communist-era. Those with yards enclose the small area with a fence and fill it completely with flowers. Farming in Poland is more old-fashioned and done on a smaller scale than in America, said Jeff. Many Polish farmers still use horses, and the small fields could be done in three rounds by a tractor. Consequently, almost all farmers do something else for their main job. One place where the McCarrons buy food is an old style Eastern European market near the townhouse where they live. People will back their cars up in a large open square and sell just about anything out of the back of their car, "like shoes or potatoes," said Diane. There were also stands that sold fruits, vegetables, and meats. Even in supermarkets, the cost of food is about a third of what we pay in the United States, added Jeff. Joe noticed that the Polish don't sell as much packaged junk food as Americans. Not surprisingly, it's rare to see overweight people in Poland. Jeff admits that he was a bit "shocked" by the number of overweight Americans at the airport on the way back. Next to the market was a giant Imax theater, which stands as a testament to the variety of old and new culture and technology in Poland. The population of Poland is much more dense than Minnesota, explained Jeff. Minnesota and Wisconsin have a combined population of nine million. Poland is the same size and has a population of 36 million. "It's not easy for a new capitalist system to support employment for that many people," said Jeff. Currently, the unemployment rate in Poland is 17 percent. Older people are the most affected by the recent switch to capitalism because they no longer receive the pensions that they were guaranteed under Communist-rule. People who are unable or unwilling to adjust to the new economic conditions are very resistant to capitalism, continued Jeff. For many, selling something at the European market is the first step toward having their own business. Poland is a country with lots of history, which is something that is hard for Americans to understand because our country is only 200 years old, and our national politics take place far away from us, said Jeff. The Polish people are very patriotic, observed Jeff. Poland has only been free since the fall of the Iron Curtain in 1989. Although it has the world's second oldest democratic constitution, it has been invaded and occupied many times during that period. The Polish have had problems with neighboring countries staking claim to their land and foreigners invading their country since the time of the Vikings. Because Poland has no natural boundaries or defenses, the only thing that has kept the Polish people together over the centuries is their strong patriotism. A good example of this was at the end of World War II, noted Jeff, when the Nazis destroyed most of Warsaw. Instead of wallowing in defeat, the undiscouraged citizens united to reconstruct the city as it was, using old paintings and photographs to recreate the city. Although the Polish are nice people, they don't typically greet strangers like we do around here, said Jeff. However, following the events of Sept. 11, the McCarrons were shown warm hearts by many caring strangers. School was cancelled, and many people, including their landlord, stopped by to see how they were doing. 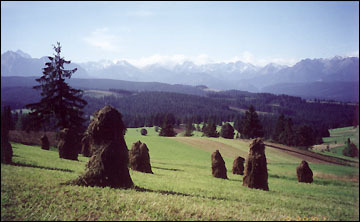 The landscape in southern Poland features many of the same types of trees as Minnesota. Poland is the same size as Minnesota and Wisconsin, but has four times the population of the two states. "People were all very supportive and friendly to Americans," said Diane. Jeff was moved by the outward gestures of kindness because he realized that they transcended culture. One of the most spectacular gestures could be seen at the American Embassy, which the Polish had surrounded with thousands of flowers and candles. Over the summer in Paynesville, the McCarron family spent their time re-connecting with family and friends. "It's nice to have something to come back to," said Diane. "Some of the people we teach with in Poland don't know where they're going next," she added. "Paynesville is home," she said. The family agreed that the biggest difference coming back for the summer was being able to understand people in public. Diane compared the feeling to being on an island, because with the exception of the school, everyone around them spoke Polish. After spending one more year teaching in Poland, Diane - who is on a leave of absence - will go back to her teaching position in the Eden Valley-Watkins School District. Jeff will resume running his business, Pacesetter Basketball. Maggie will be a senior at PAHS, and Joe will be in high school as well. After teaching students of 56 nationalities, from South Africa to Korea and Japan, Diane says she's learned that, despite their different backgrounds, they're all "just kids." The more she travels, the more she realizes that "there's more similarities than there are differences, so the world doesn't seem so big and scary," she said.